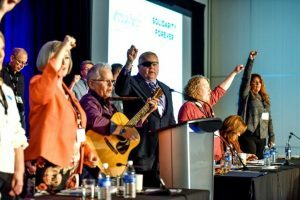 The 2018 Convention is now in the books but you can re-live some of the best moments by accessing the resources below. Look back on each day of the 2018 Convention with our daily recaps. Click on the links below. Watch some of the prepared videos, as well as the videos of key speeches, by going to our YouTube page and checking out the playlist for Convention 2018. Christy Slusarenko was elected as Vice-President for the Combined units. Rysa Kronebusch was elected as Vice-President for the Utilities unit. Annette Toth was acclaimed as Vice-President for the ICBC unit. Click here to see the resolutions submitted to Convention. Connect with your fellow attendees and get quick access to schedules, speaker information, and push notifications for important updates right to your smartphone. Download the MoveUP Convention 2018 app now! Available for Apple and Android devices. A web-based version is also available for PC, Blackberry or Windows devices. Make sure you create a profile and update your name so you show up on the list of attendees! MoveUP’s Constitution & Bylaws can be found here.